“Here I go,” says a somewhat pensive Zsofia Duarte ’18 as she lowers her index finger toward the track pad of her laptop. And with a click, Duarte clears the biggest and most pressure-packed hurdle of her thesis project: the online submission of her 115-page document to the college’s searchable scholarly database known as SCARAB. Duarte is sitting in a quiet part of Ladd library; appropriately, she’s near the Bates history section. While she’s flying solo as she navigates the various dropdown menus of the SCARAB form, this pivotal moment is bookended by friendship and community. Earlier, friends surrounded her for a Bates tradition, in which first-years help seniors bind a hard copy of the thesis (hard copies aren’t always required, but seniors love the tradition). Later, she’ll go to dinner with friends at a cozy Lewiston restaurant, Boba, famed for its fusion of French and Asian cooking. An environmental studies major and one of the college’s Community Engaged Research Fellows, Duarte examined the local food movement as it plays out at the Lewiston’s farmers market, specifically looking at the experiences of Somali Bantu food producers. 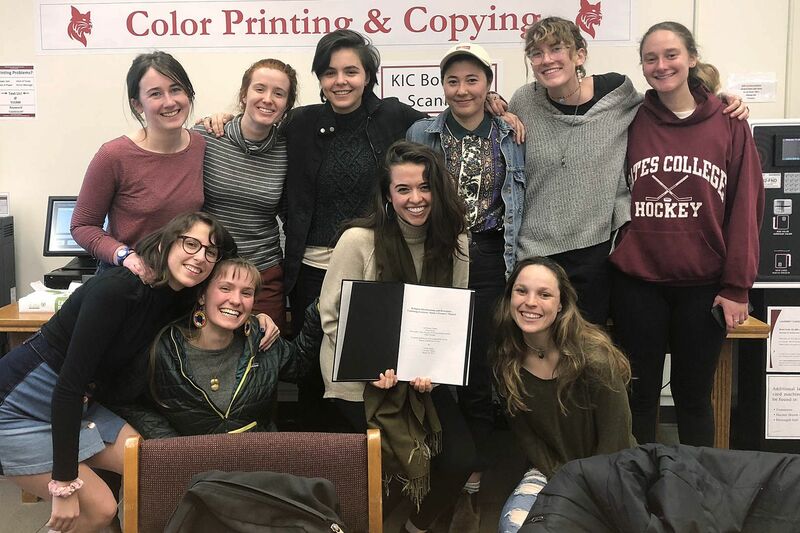 Friends surround Zsofia Duarte ’18 after the traditional binding of her senior honors thesis. While all Bates seniors complete a thesis or capstone project, a select few — less than 10 percent of the class — are invited to conduct a supercharged version of thesis, the honors thesis. An honors thesis is an academic triathlon. It’s months of research, often beginning in the junior year; months of writing and revising under the guidance of a faculty adviser; and then the submission and concluding defense, in which a committee of scholars interviews and challenges the thesis conclusions.